It might be overkill for simple delay tasks, but if you want something substantial that goes far beyond the territory of traditional echo boxes, MFM 2 is perfect. Great delays... and more. Flexible, semi-modular routing system. Gorgeous u-he filters. Envelopes that'd make many a synth blush. User LFO waveforms. Some users might find it a bit mind-boggling. Delay may be the single most important effect we have at our disposal. Whether it's in the form of crazy slapback effects or spacious cosmic echoes, delay is a crucial ingredient in virtually any modern production. 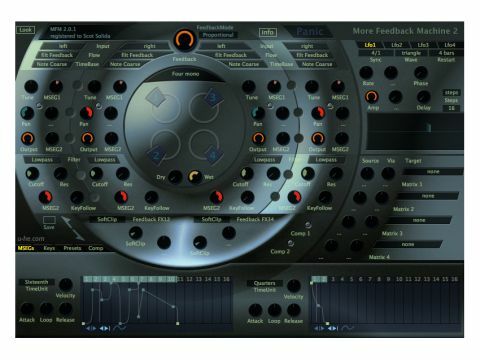 With More Feedback Machine 2, codehead extraordinaire Urs Heckmann has crafted a delay that oozes bells and whistles, and adheres to his philosophy that each and every parameter ought to have a knob attached to it. The plug-in supports the VST and Audio Units standards and gives you access to four channels of parameter-packed echo generators. You can select various input sources (left, right, summed to mono or none) and each processor offers tempo-synced echoes with independent pan controls and a multimode resonant filter sporting seven of u-he's acclaimed filter types. The feedback signal can be processed by a pair of selectable effects units, with the options being Phaser, Sideband (a frequency shifter effect), SoftClip, Decimate and Filter. Furthermore, you'll find a pair of awesome dynamics processors in tow that let you maximise or compress the signal. All of the expected functions are present and accounted for, including threshold and definable attack and release times. Synthesis-style modulation is here too in the form of four LFOs, each of which has all the trimmings. You can choose from nine waveforms, including a user-defined one that can contain up to 32 steps. Similarly, there's a pair of multistage envelope generators onboard, each of which enables up to 32 steps to be snapped to tempo values. Envelopes can be looped and every segment has an adjustable slope - the loop points are altered by dragging in the ruler above the envelope display, and the loop rate is determined by a dedicated knob. It's a simple and effective system, which is just how we like it. On the subject of the GUI, the default Hard-Boiled skin gave us a bit of retina fatigue, but switching to the Cinnamon interface's clean design provided some respite. The big, knob-packed interface might be off-putting to some, and the routing might baffle first timers, but it all becomes clear once you shoot a signal through the thing and actually start tweaking. The factory patches are excellent across the board, offering everything from Bela Lugosi's Dead dub echoes to swirling, nebulous atmospheres that will have even the most jaded space-rockers donning their pressure suits for a bit of far-out sonic exploration. More Feedback Machine 2 is a dream delay. In fact, we're inclined to suggest that it's much more than just an effects processor, and can almost be considered a musical instrument in its own right. Enthusiastically recommended.